Although sebhorrheic keratoses (seb-o-REE-ick Ker-ah-TOE-sees) are often quite confused with warts they are quite different. 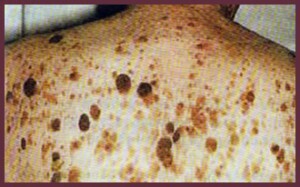 Seborrheic Keratoses are non-cancerous growths of the outer layer of skin. There may be just one growth or clusters. They are usually brown but can vary in color from light tan all the way to black. They’re different sizes as well–anywhere from a fraction of an inch in diameter to larger than a half-dollar. A main feature of seborrheic keratoses is their waxy, pasted-on or stuck-on look. They sometimes look like a dab of brown candle wax that has dropped onto the skin. Almost everybody will eventually develop at least a few of these growths. They are sometimes referred to as “barnacles of old age.” These become more common and more numerous with advancing age. Some people develop many over time, while others develop only a few. Sometimes sebhorrheic keratoses may erupt during pregnancy, following estrogen therapy or in association with other medical problems. Sebhorrheic keratoses are most often found on the chest or back. They’re also found on the scalp, face, or neck or almost anywhere on the body. They’re less common below the waist. Since they are not caused by sunlight they can be found on sun-exposed or covered areas. When they first appear, the growths usually begin one at a time as small rough bumps. Eventually they thicken and develop a rough, warty surface. Can anyone get seborrheic keratoses? Although sebhorrheic keratoses may first appear in one spot and seem to spread to another, they are not catching. As people age they may simply develop a few more. Everybody gets at least a few of these growths. Unless they develop suddenly they do not indicate a serious health problem. They’re not related to skin cancer. They may be unsightly, especially if they begin to appear on the face. They can get irritated by clothing rubbing against them. Because they may grow larger over the years, removal is sometimes recommended especially if they get irritated and bleed easily. A sebhorrheic keratoses may turn black and may be difficult to distinguish from a skin cancer. Sometimes such a growth must be removed and studied under a microscope to determine if it is cancerous or not. Salves, ointments or medication can neither cure nor prevent sebhorrheic keratoses. 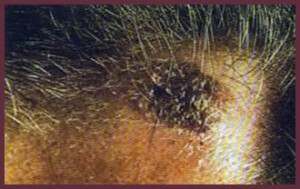 Most often sebhorrheic keratoses are treated by one of three methods. One method is called cryotherapy, or freezing. A very cold liquid called liquid nitrogen is applied to the growth with a cotton swab or spray gun to freeze it. Blisters may form under the growth that dry into a scablike crust. The keratosis usually falls off within a few weeks. No mark is usually left, although occasionally there may be a small dark or light spot. These will fade over time. Another method is called curettage. The growths are removing by “curetting” or scraping them from the surface of the skin. An injection or spray is first used to numb the growth us removed. No stitches are necessary and bleeding is very limited. It can be controlled by applying pressure or by the application of a blood-clotting chemical. Electrosurgery is another form of treatment. The growth is first numbed, then burned using an electric current and then scraped off. What seborrheic keratoses are not! Although these growths are frequently confused with moles, warts and melanoma skin cancer, they differ in a variety of ways. Moles are skin-colored or tan to brown in color. Almost everyone develops 20-30 moles during his or her lifetime. 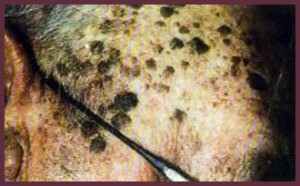 Actinic keratoses, also called solar or senile keratoses, are caused by the sun and occur on body areas that have been exposed to sunlight. The face, hands forearms and the V of the neck are the most common areas for actinic keratoses. These growths are more common among pale-skinned, fair-skinned, light-eyed individuals. They are flatter, redder and rougher than sebhorrheic keratosis. Actinic keratoses are pre-cancerous, which means they may become skin cancers. Any raised, reddish, rough-textured growth should be examined by a dermatologist. Melanoma is serious form of skin cancer. Melanomas are often, but not always, very dark brown to bluish-black growths. Melanomas may be confused with sebhorrheic keratoses because both can become very dark. It is wise to have any growth that turns dark or becomes irritated checked by a dermatologist. Early detection of skin cancer is the best way to assure successful treatment.